OK, so why alarm pheromones? Well, many social insects coordinate their defences against predators using chemical signalling. These signals can arouse a colony into defensive behaviour, and often can be applied to attackers to attract other workers to attack the intruder. In some cases these chemicals are one and the same, in others, they may be different. No matter! 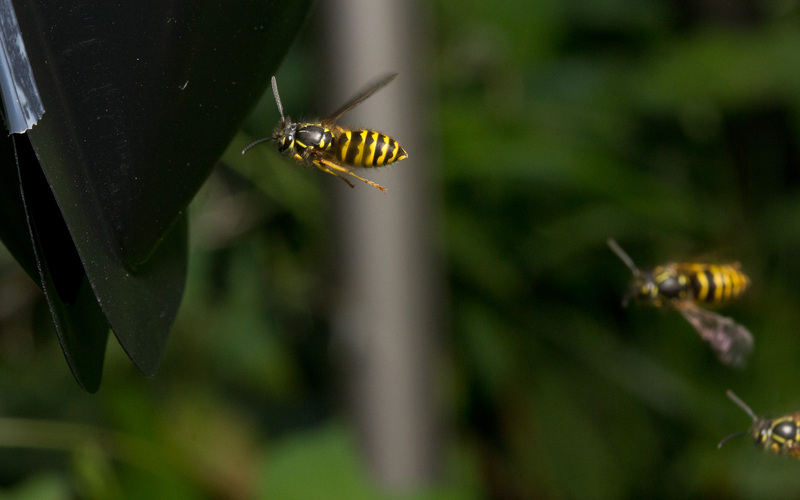 Although our efforts here were part of an attempt to describe the alarm pheromone chemistry of these yellowjackets, we never did succeed in isolating the exact chemicals needed to mimic the naturally-occurring alarm pheromones. 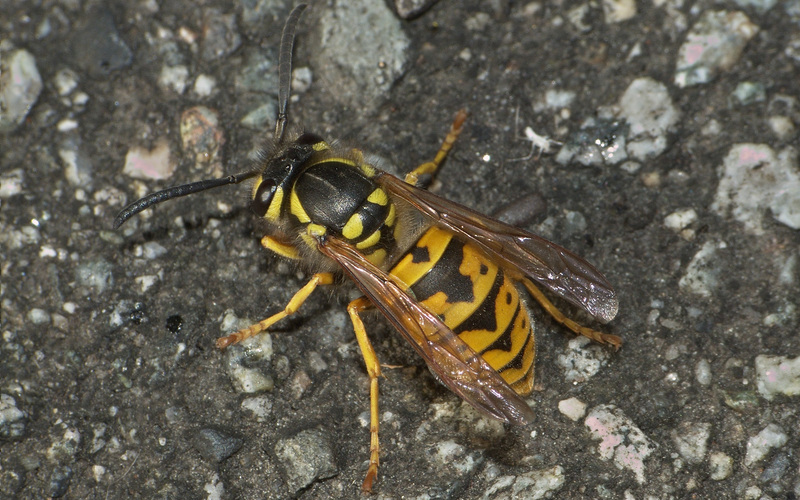 Many wasp species have their alarm pheromones in their venom sac, and presumably, when disturbed extrude a little venom to signal other workers, or deposit venom on nest predators to “mark” them for attack by the colony. 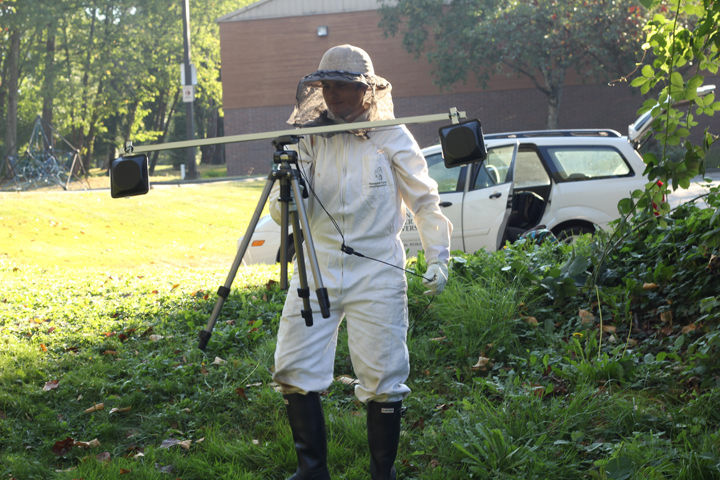 We worked with three species of yellowjackets, Vespula pensylvanica, Vespula alascensis and Vespula germanica. The substances we tested in this study were venom sac extracts of these wasps dissolved in acetonitrile, an easy-to-work with polar solvent. We dissected out venom sacs (the translucent jelly-bean looking thing) and crushed them in acetonitrile, at a rate of 1 sac per 10 microliters. We filtered the extracts and stored them cold for later use. In 1995, Visscher and Vetter (yes, that Vetter! The spider guy!) 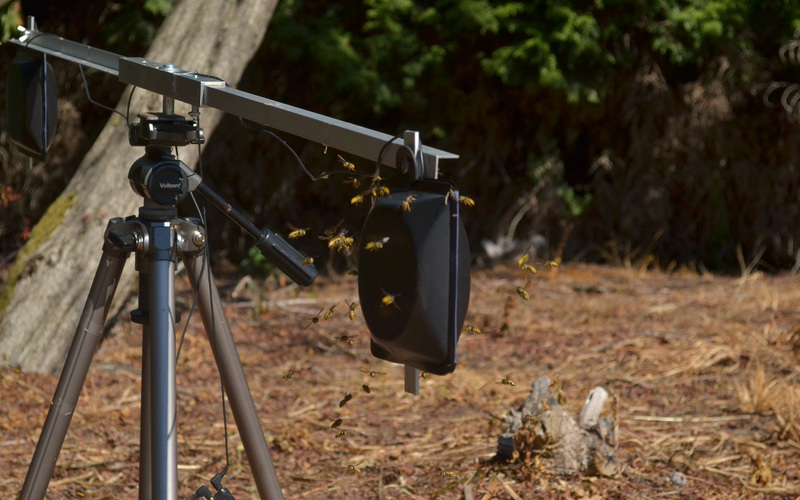 developed a resonant-target attack counter for use in quantifying defensive attacks by yellowjackets and bumblebees. It so happens that when these flying stingmeisters attack, they fly at high speed toward their victim and strike it with force. 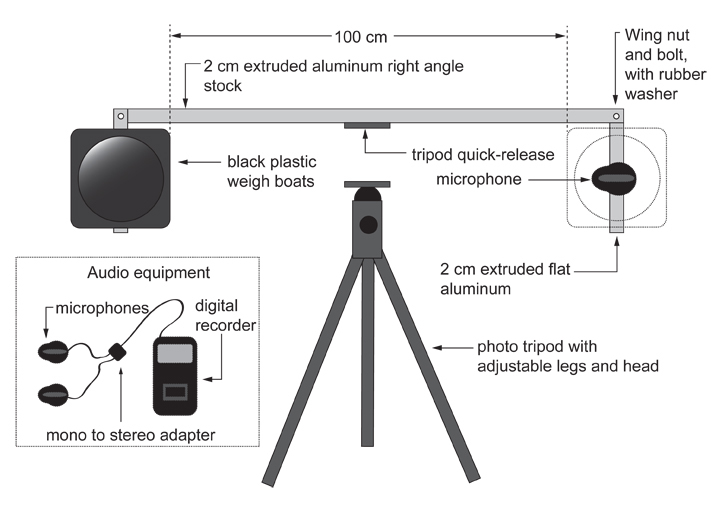 Visscher and Vetter’s device utilized this important fact by surrounding an audio microphone with a resonant plastic target, and using an electrical counter to count the hits. The device requires construction of the counting circuit, but I thought, why not just record an audio file and count the strikes later? Basically the device I designed is an elaboration of Visscher and Vetter’s strike counter, only it can be assembled with off-the-shelf components, and utilizes free software to count the strikes recorded to an audio file. In addition, my design is explicitly for use in paired assays, as wasp attack behaviour is often quite variable from one situation to the next, and experiments to test the effect of alarm pheromones can benefit greatly by pairing the treatment and control in each replicate. Think of it as blocking! 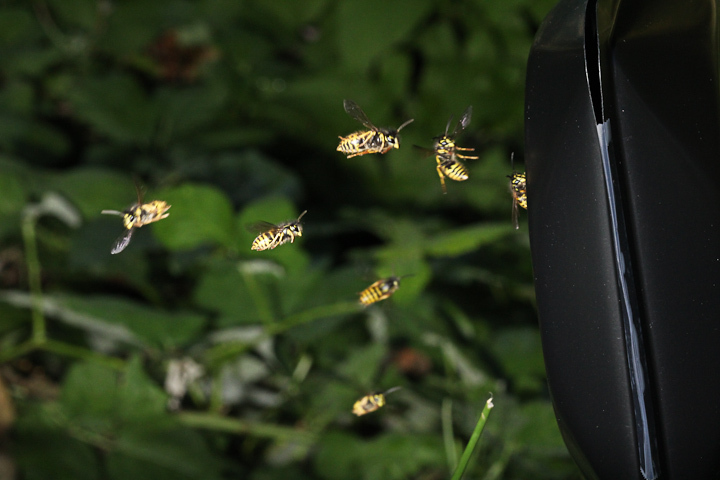 at 9 am, the wasps are really feisty, and hundreds come out to strike, at 10:30, the attack is less fierce. If we did a control run with a single target at 9, and a treatment target at 10:30, we would be misled, but with a paired design we can determine that our treatment has an effect in both replicates. This saves immensely on the number of replicates required to see a difference. The vast majority of the components are very easy to acquire, and the only construction requires a bit of drilling and screwing in of wingnuts and bolts. Everything else is off-the-shelf, and the device folds up neatly for transport and storage. 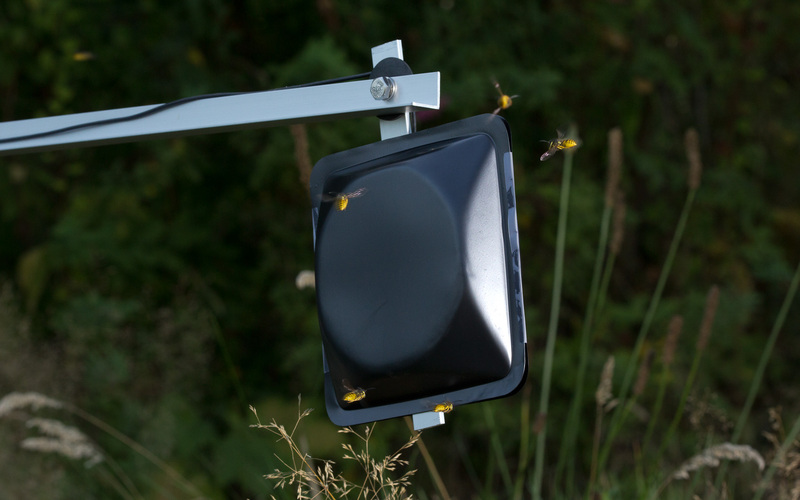 The targets are formed from thin black polystyrene weigh boats, which make a drum-like sound when struck, and they can be disposed of between each replicate so that residual alarm pheromone is not a problem. Onour Moeri bringing the paired target device to the wasps. 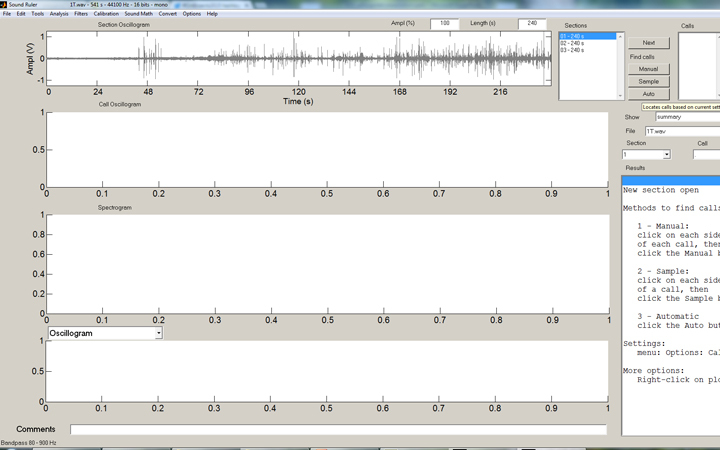 Here is a video of the device in operation, with audio derived directly from the paired microphones. In this case, the pheromone extract is placed on the left-hand side of the device. After each assay, the device is removed, the targets replaced, and then the treatment and control are re-applied for another replicate. I always alternated the left-right placement from one replicate to the next, to avoid any side bias. After a number of replicates (at least 10, better 15 to 20), the audio files are offloaded from the digital recorder, and split into treatment and control files for each replicate. You can use Audacity (a freeware program) to do this. 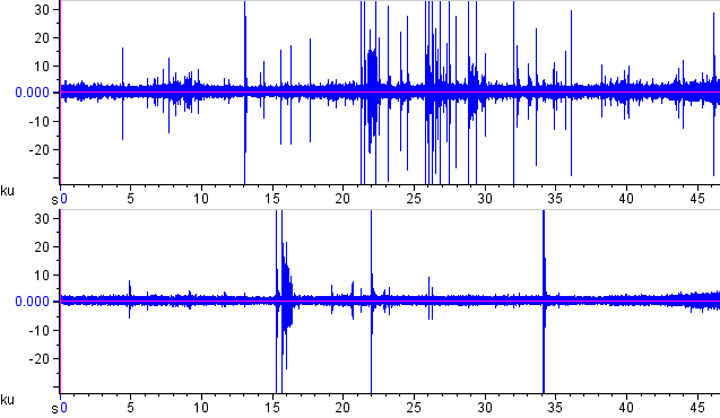 A simple oscillogram of each file often shows an effect: This is how the two oscillograms look for the left (top) and right (bottom) channels. As you can see, the left hand side experienced more strikes in this short clip. But how to count these strikes effectively? 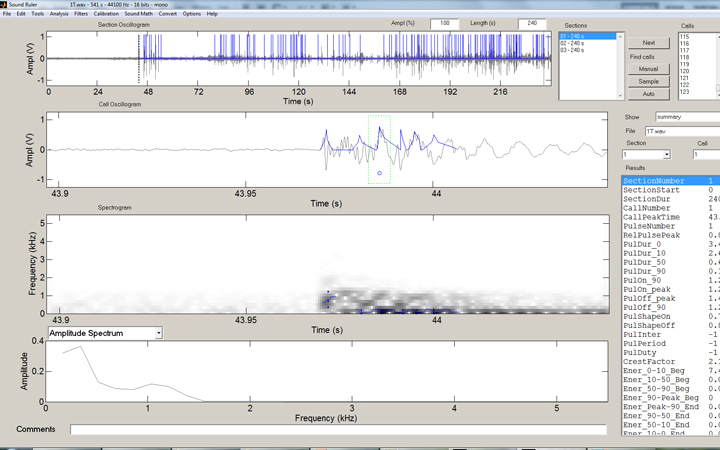 Well, the solution is another freeware program, SoundRuler, developed by Marcos Gridi-Papp for his teaching in bioacoustics. My application of this software is really wasting its potential, but it works quite well for counting these loud percussive strikes! The SoundRuler interface with an open audio file of 240 seconds. The same file after automated counting enabled. In this case, 123 strikes were counted. Alright! So that is the development of the paired-target bioassay device, as well as its operation. What did we use it for? 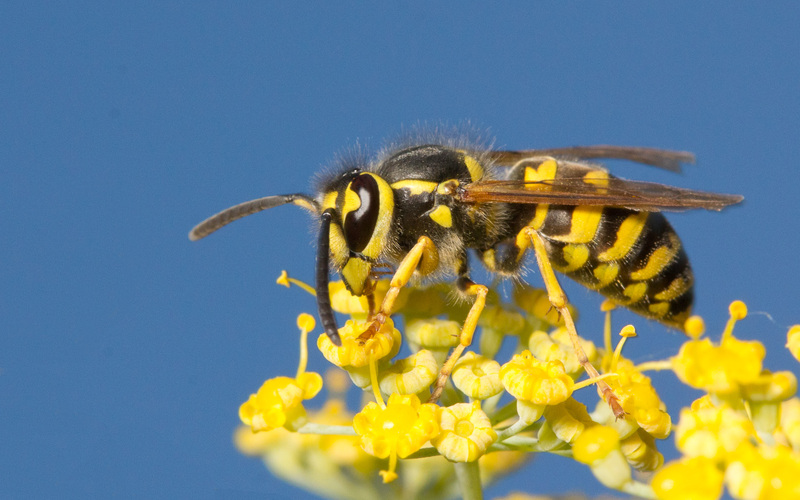 Well, we tested whether three species of ground nesting yellowjackets, Vespula pensylvanica, Vespula alascensis and Vespula germanica have an alarm pheromone in their venom sacs. 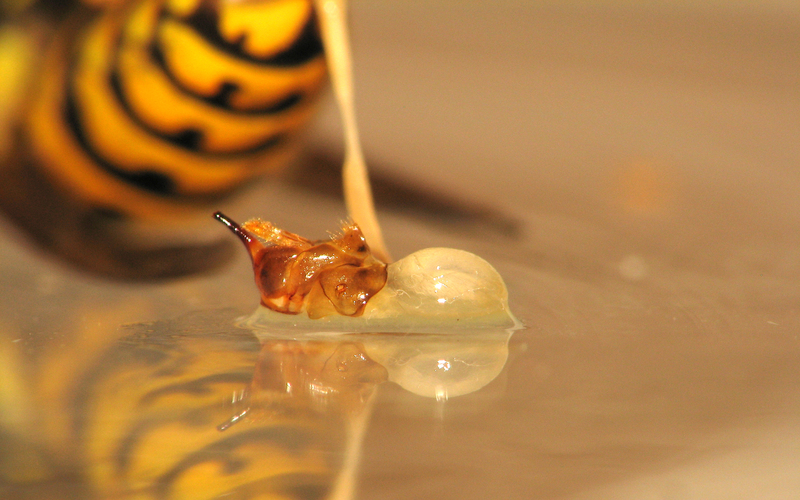 We also tested whether or not these species would recognize the alarm pheromones of the other species. It turns out that they do! So what would be the advantage of responding to the alarm pheromone of another yellowjacket species? Well, each of these species has a very similar life history, being ground-nesting, and needing to defend the nest from the same kinds of predators (bears, skunks, raccoons, humans). I can see the advantage of responding early to a “pheromone-marked” predator which had just attacked another species, stinging it and driving it away before it has the chance to attack your own nest. 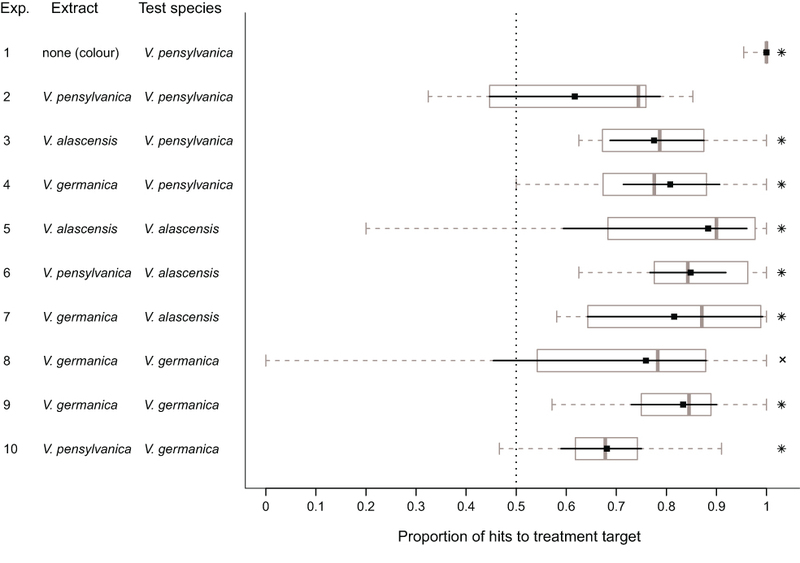 These alarm pheromones probably evolved once in the vulgaris species group, and there was no selection for differentiation, and possibly selection against it. So there you have it! 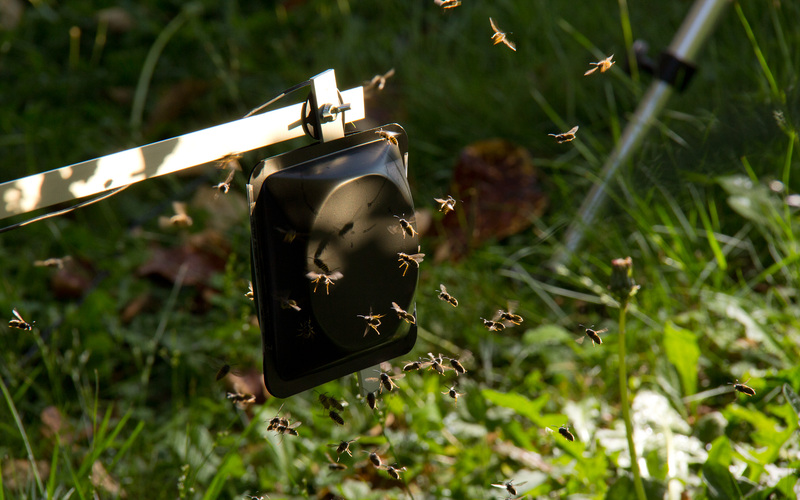 An inexpensive, easy to construct bioassay device that you can use to test alarm pheromones in large stinging wasps! A counting protocol that is easy and fast! What more could you want? Well, I suggest that the first thing you could wish for is very good luck and/or insight into the complicated chemistry of these alarm substances, but this study has at least provided some new tools to get there. OK! So that is the paper. I hope you enjoyed it, and be sure to read the whole thing over at the journal website! In the meantime, please enjoy these awesome pictures of the bioassay device in operation. Well-researched and written and understandable to the non-scientist as well.